Often, one carrier catered to all different service levels. These options were hard-coded into the checkout process and looked the same for all consumers regardless of where in the country they resided. Over the past two years, there has been a transformation in the e-commerce checkout experience from the one-size-fits-all approach to one with various options based on where in the country the consumer resides. Susie in Manhattan enjoys many same-day delivery options for items ranging from groceries to clothing. She enjoys a front row seat to all the delivery innovations taking place in the U.S., whether it’s lockers, crowd-sourced delivery providers, or real-time visibility and control of the delivery process through her mobile device. Susie is used to fast delivery and is probably pretty frustrated if something takes longer than 2 or (heaven forbid) 3 days to arrive. Steve in Idaho, on the other hand, is still used to the experience of old, where things arrive in around 5 days, and only with very select merchants can he get anything better when it comes to free (or cheap) shipping. For Steve, things still look pretty much as they did two or three years ago. Susie is a “have” when it comes to the e-commerce experience. She enjoys a level of speed, flexibility and convenience that was unheard of a few years ago. Steve is a “have not” and won’t be seeing similar experiences anytime soon. Make no mistake; the bar for speed is being raised for all consumers. As I’ve mentioned in previous articles, that 3-day delivery is the new average experience expected in the U.S. That said, the delivery time is becoming extremely fast for select consumers in major metro areas. This development has huge implications for retailers: If you don’t meet the bar, you will lose sales and/or frustrate your customers. As things get faster, it is also increasingly cost prohibitive to use the static approach of old. Steve simply cannot affordably be given the same-day or a next-day experience that Susie has come to expect. 1. Dynamic Experiences at Checkout. Recognizing that Susie in Manhattan and Steve in Idaho should be presented with different delivery experiences through the checkout process. Free shipping for Susie can look very different than free shipping for Steve. Susie gets a next-day offer because the retailer has a distribution center (DC) in New Jersey just a few miles from her home, and while Steve does not because the DC is thousands of miles away. To do this successfully, the retailer’s webshop and checkout process needs to be able to make these decisions real time, and present the appropriate options for each unique shopper. 2. Regionalized and Localized Fulfillment. When it comes to shipping e-commerce packages, distance equals time and money. In order to cost effectively offer same-day or next-day delivery, the retailer needs the inventory closer to the consumer. Holding stock locally makes sense in major population centers such as Los Angeles, New York, and Chicago. Whether it’s through dedicated digital facilities, multi-user 3PL centers, converting wholesale / retail DCs to support B2C, shipping from store, or even drop shipping from vendors, merchants are finding ways to localize. The fulfillment landscape is becoming much more fragmented as a result. 3. Order Management and Inventory Visibility. The key to bridge items one and two above starts with the ability to see inventory across a much more fragmented inventory landscape, and then determine the available service levels and make this information available to the webshop. Finally, the retailer has to route and process the order from the most appropriate fulfillment location and with the lowest cost shipping type. Order Management System (OMS) technologies are the key to executing these strategies efficiently and effectively. Furthermore, vendors now sell across multiple channels (e.g., Webshop, Amazon, Etsy), each with its own unique service level expectations. Consolidating these channels and optimizing order execution is facilitated through the OMS. 4. Multi-Carrier Dispatch. Working with more than one carrier is an essential capability moving forward. Crowd-based carriers and metro couriers are important channels for affordable same-day delivery. Carriers such as DHL eCommerce are key for offering more affordable shipping of light-weight parcels and affordable 2- to 3-day delivery. Regional carriers can provide cheaper solutions for next-day and 2-day deliveries to select ZIP codes. As the fulfillment landscape fragments, so will the carriers used. In 2012, only 25% of B2C shippers in the U.S. used more than one carrier. By 2015, that number had grown to 35%. The 2015 figure is more pronounced with the larger merchants, with 45% of companies with more than 100 employees leveraging multiple carriers. By the end of 2017, I expect that number to grow to more than 60%. Multi-carrier strategies are critical to both speed and cost reduction, and retailers must adjust their distribution strategies as a result. Supporting multiple carriers can have large implications on the physical layout and dispatch process of a fulfillment center. 5. Rate and Service Shopping. With multiple shipping options, the merchant needs to be able to make intelligent dispatch decisions. For a given service level (e.g., 3-day) and a given order profile (size, weight, origin ZIP, destination ZIP), the merchant needs to be able to choose from a variety of shippers to accommodate the service level at the lowest possible cost. Localization offers a huge opportunity to downgrade shipping type while maintaining or even improving service levels. In the old world, 2-day might have always resulted in a routing of a 2-Day Express product. 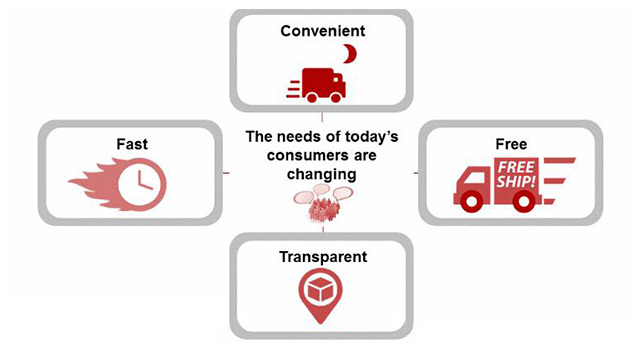 In the new world, evaluating the expected date of delivery, location of order fulfillment, location of delivery and order parameters allow for the possibility of a much lower cost carrier and product selection while still maintaining consumer expectations on delivery. Some retailers code this logic directly in their Warehouse Management System (WMS). Others choose to work with third-party shipping technology providers. Rate and service shopping are very important capabilities today, both in meeting consumer expectations and controlling costs, and will be increasingly important moving forward. • A network of transactional fulfillment centers focused on servicing e-commerce consumers with locations in the U.S. and around the world allowing for consumer proximity and regional/local fulfillment. • An Order Management System that comes plug-and-play with our fulfillment solution, enabling intelligent order orchestration and flexible fulfillment strategies across the DHL transactional fulfillment network, as well as third-party fulfillment nodes such as legacy facilities, store networks, and so forth. • DHL SmartMail Expedited Max enabling affordable 2- and 3-day definite shipping to every ZIP code in the U.S. We bring a 3-day experience to the masses without breaking the bank. • DHL Metro Logistics that manages a very fragmented set of delivery partners across U.S. metros to simplify same-day delivery for the retailer. It also brings a best-in-class delivery experience through a mobile-based technology platform. • APIs to support rate and service shopping decisions across the DHL eCommerce product portfolio. To learn more about DHL eCommerce and e-commerce order fulfillment solutions, visit www.dhl-usa.com/ecommerce.